Always have your work light on hand! Good lighting is an important part of paint correction – especially when you’re looking to achieve perfection. If you don’t have good lighting many of the swirls and scratches in the paint can go unmissed and continue to reduce the gloss. Thanks to many correction chemicals’ specifications, swirl and defect removal just isn’t possible in the sunlight. The solution? A high-quality “swirl finder” light! SCANGRIP Matchpen lets you hone your beam of light in specific areas for a thorough inspection. SCANGRIP Matchpen provides more than enough lighting to find each and every paint defect for removal. SCANGRIP uses LED bulbs with a high CRI rating (Color Rendering Index) for ultimate color matching – making it perfect for use in auto body shops that need exact results. 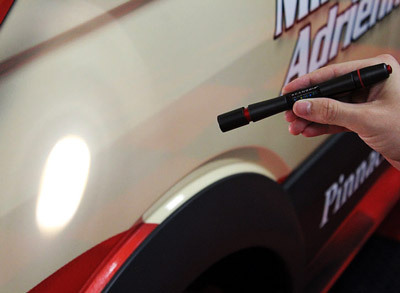 Paint defects won’t have any place to hide when using the SCANGRIP Matchpen Light! Perfect for inspection before you begin, or during your last walk around the vehicle, SCANGRIP Matchpen Light is small enough to be easily held in your hand, and features a sturdy clip to attach to clothing when not in use. Powered by AAA batters (two already included) SCANGRIP Matchpen Light is a necessary addition to your detailing repertoire.